All-natural. With real milk & cream. No artificial ingredients. Per 1 Tbsp: 35 calories; 1 g sat fat (8% DV); 5 mg sodium (0% DV); 5 g sugars. Made with only milk & cream, sugar. Natural sweet cream flavor. Good food, good life. 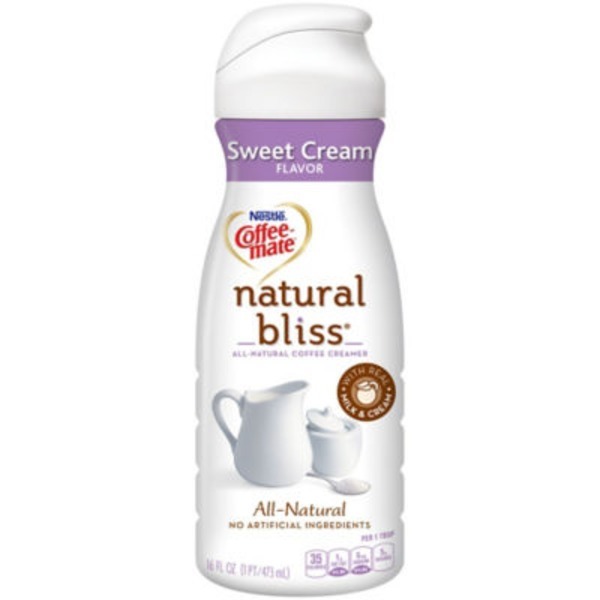 Good Question: What is special about Coffee-Mate Natural Bliss? Good to Know: Ahh, the sweetness. Ooh, the creaminess. And in delicious, all-natural flavors, it's just right. Good to Remember: Use in moderation for your perfect cup. 1 tbsp = 35 calories. Nutritional compass. Please recycle. Gluten-free. Grade A. Homogenized. Ultra-pasteurized. Completely remove freshness seal under cap.Shake before use. Keep refrigerated. Store between 33deg and 45degF. Do not freeze. For best quality, use within 14 days of opening.